The Joint Planning Meeting for the Regional Networking Forum and Capacity Development Training for Technical Cooperation Agencies was hosted by the United Nations Office for South-South Cooperation (UNOSSC) Istanbul Office on 13-14 February 2017 in Istanbul, Turkey. 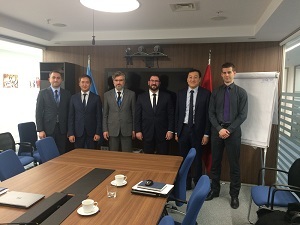 Together with SESRIC, the meeting was participated by the Astana Regional Hub of Civil Service in Astana (RHCS), Ministry of National Economy of the Republic of Kazakhstan (MNE), and the Islamic Development Bank Group (IDB). The main aim of the meeting was to initiate necessary preparations for the planned Second Regional Networking Forum and the capacity building training which will be held in Astana on the sidelines of the Astana Economic Forum in Kazakhstan, scheduled for June 2017. During the two days discussions, the representatives of the partnering institutions reviewed and discussed the details of the Second Regional Networking Forum and the capacity development training, and principally agreed on the overarching themes, focus, and structure of the sessions of the Second Networking Forum and the subjects of the capacity development training program. The First Regional Networking Forum was first convened in 2016 in Dubai, UAE within the framework of the Global South-South Development Expo with a view to establish new partnerships, agreement on joint projects and innovative practical solutions and exchanging approaches in order to formulate national South-South Cooperation strategies which would improve the national level coordination of cooperation activities.